Arthur Vickers crafted the Leadership Desk from old-growth cedar long ago salvaged from a burn pile. 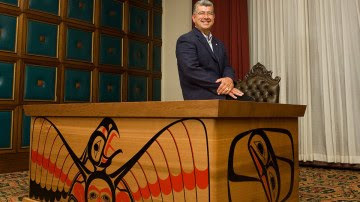 The spectacular desk will be used by the premier of British Columbia. Photograph by Arnold Lim. The premier’s new desk is a work of art. The artist Arthur Vickers has created what he calls the Leadership Desk in the form of a large bentwood box. He has painted figures from First Nations’ iconography on all sides of what is breathtaking, one-of-a-kind piece. The artist offered a sneak peek at his creation yesterday in a room on the ground floor of the Union Club. The desk is to be moved today (Thursday) to the premier’s office at the Legislature. Mr. Vickers, 62, enjoyed showing off some of the unique features. He stepped to one side, turning his large but nimble artist’s hands palms up, fingers resting beneath the overhang. He smiled like a man satisfied that 42 long months of creative endeavor had ended in so satisfying a style. The attention to detail is remarkable. The vertical grain matches along all four sides of the desk, a challenge he described as monumental. Even his painting of figures presented difficulties. More typically, he paints on a canvas placed on an easel. For the desk, he used sign painter’s paint, like those used on billboards, for its durability in withstanding the fading effects of sunlight. After decades as a painter, he needed to familiarize himself with paints of unfamiliar qualities, not to mention brushes for which he was unaccustomed. To prevent spills, he made stencils to protect completed sections. After the design was approved, Mr. Vickers began hunting for recovered wood, seeking an “old grey ghost” of a dead standing tree. He found the perfect sample stored by friends who own the Cowichan Shipyard at Cowichan Bay, where the artist now lives and operates a gallery. The couple salvaged the cedar from a burn pile more than two decades ago, storing it at the shipyard for possible future use in the building of a boat. Instead, that wood will now rest in the premier’s office. The artist spent some time contemplating the wood before finding in it the final shape. He sat in a chair facing the desk, describing the striking image painted in red and black on the facing panel. “As you look at the front of the desk, you’re looking at an eagle, its wings are spread open as a blanket of protection for a young eaglet that is looking right at us. The designs on the back panel include a male and female with arms outstretched in an entrusting gesture. They represent the current generation of British Columbians, while the side panels depicts a future generation awaiting birth. Mr. Vickers was born in Vancouver to a mother of English and Canadian ancestry and a father of Tsimshian and Heiltsuk lineage. He spent his childhood in the Tsimshian village of Kitkatla, where he spent much time with his grandfather, a fisherman and canoe carver. The boy learned to carve, later working as a fisherman and finishing carpenter himself. He dedicated himself fulltime as an artist only in 1989, after suffering what he describes as “a horrific breakdown” after constructing, in longhouse-style, the Eagle Aerie Gallery in Tofino for his brother, fellow artist Roy Henry Vickers. Arthur Vickers was named to the Order of B.C. last year for raising hundreds of thousands of dollars for charities by donating artwork. He hopes his desk will not be treated as an untouchable artwork. The dents and scratches a working desk receives adds a patina of history, he said, another layer in the stories to be found in his latest work.